From church to chapel to classroom, Herrick Auditorium has proven itself to be a trusty old plow horse of a building, ever morphing to serve the campus. Believe it or not, Herrick was built in 1925. This was just sixteen years after the founding of the City of Bethany. The young church known as Bethany First Church of the Nazarene built the building with a seating capacity of 1000, rather ambitious at a time when the city’s population was scarcely 600. Originally, the structure was only an auditorium with a great u-shaped balcony, basement rooms for Sunday school and an ambitious seating capacity. In those early days of Bethany Peniel College (BPC), very few students had cars, so many simply walked across campus to attend church; this also truly made it the College Church. This building had a profound impact on those who experienced worship there. Today the only visible thing that remains from this original structure is the roof. In 1946, a three story educational unit was added to the north side of the original church building. This section of the building added much needed Sunday School classroom space as well as space for church offices. Today, this section houses the Speech and Communication, Education and English Departments of SNU. As the City of Bethany grew, the church and college also grew. In 1959, BFC launched a $300,000 building program to renovate, expand and modernize the building. During this time, the old brick parsonage that sat next to the church was removed. This space was used to create more church offices and classroom space. Today, this area houses the Information Technology department. This renovation sought to make the building more accessible and to do so required the removal of the old brick façade, removal of the towers, steep stairs and balcony. This was replaced by the current ground level entrance and a mezzanine within the building. 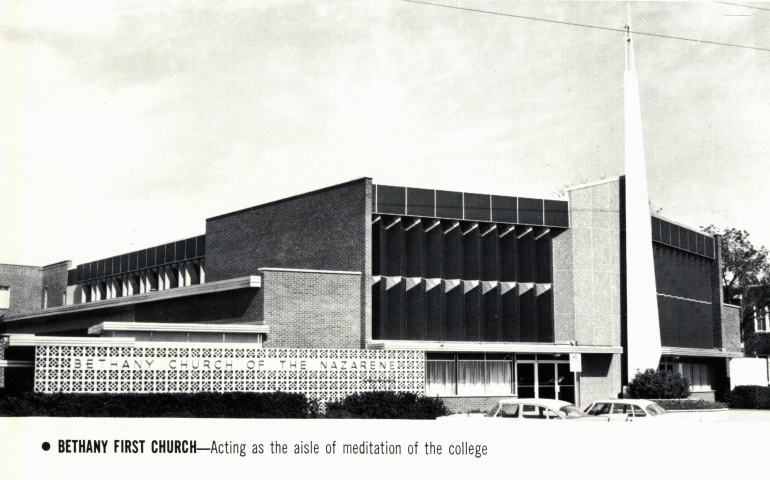 In the mid 1960s, Bethany Nazarene College’s enrollment was at such a boom that it had started using BFC for its chapel as well as classroom space for the English, Speech and Education departments. In 1965, the college launched a $450,000 campaign to purchase the building from Bethany First. In 1969, Bethany First was also growing as fast as ever, and a new church building was built across Asbury Lane where the congregation has met since. That same year, the college purchased the building. After the building was purchased, an extensive remodel was carried out. This remodel was funded largely in part by Mr. and Mrs. James Herrick, wheat farmers of Johnson, Kansas. This building was named in their honor and now serves the campus of Southern Nazarene University as Herrick Auditorium. In 1974, the stage area was again renovated using wood from the old gymnasium which sat behind Bresee Hall. In 1997, the north wing, former Educational Unit of BFC, was renovated and modernized again, and an elevator was added. Today, this building houses the Speech and Communication, Education and English Departments of SNU, as well as chapel and other musical and social events. At almost ninety years old, Herrick Auditorium stands in testimony to those church members, faculty, staff and students who have come before us. It is also a reminder of those who have sacrificed and given to this campus and help make it what it is today. I am certain Herrick Auditorium will continue to serve our beautiful campus for many years to come.